I'll ride through the center of town on my way home, I told myself, and see what kind of mess the protesters made this afternoon. But as I neared, the number of police and riot-squad vehicles became uncountable, with many of the entrances into the historic center blocked by barricades or police covered in armor and helmets standing shoulder to shoulder behind shields. I could hear explosions coming from nearby and before I could connect the dots, my eyes and nose were running. The cool night air felt spicy in my lungs. 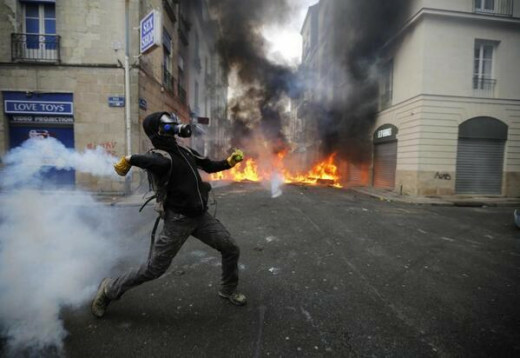 Stun grenades and tear gas. The protest was nowhere near over. People on their way to meet friends at bars hopped across police lines, students perched on dangerously high heels tottered across the ripped up iron track of the tram and past a still smoldering ticket counter. The city looked like a war-zone, it was getting harder and harder to breath, but that was not going to spoil these folks' evening. It was saturday night and nothing could stop them from enjoying themselves, they would just have to pull their scarves across their faces until they got a bit farther away. I wasn't going to be able to go home the way I had planned, so I decided to stop and watch as flares shot high into the air just on the other side of the city block. Someone in a nearby apartment set speakers up in front of the open window and blasted Edith Piaf … non, rien de rien… non, je ne regrette rien … In the quickly fading light, with sparks flying into the night sky, the rumbling of small explosions echoing between the cream colored buildings and a smoky haze rolling down the streets, riot-police and pedestrians alike turned toward the window, some chuckling to themselves, but no one speaking. It was one of those rare, perfectly cinematic moments in life. The song ended and the street slipped back into a hum of urban life. I wheeled my bike on, thinking about finding a way around all of the barricades. I didn't want to risk riding it here; the streets were littered with twisted metal, broken glass and spent flares. I turned left, walking up the tram line, where a group of people were gathered. The path here was slightly elevated with a view of the other side of the city center. Just beyond them were even more riot vehicles, more than I ever imagined the city having, covered in protective cages and surrounded by police forming a solid barricade. The protesters had set up their own barricades as well, about 50 feet in front of the police line, leaving a sort of no man's land of broken bottles, and stones that had fallen short of their intended targets. Farther behind the barricade roared a fire, dangerously close to a block of apartment buildings. From this vantage point, we could see the silhouettes of the protesters surging around the flames. All of us stood mesmerized. People on their way to restaurants, protesters from that afternoon, passer-byes, in awe of the vision of our normally quiet city. The shadowy figures dancing through smoke and fire in front of us like some barbaric ritual, the entire city's police force surrounding the rest of our field of vision and the streets covered in refuse from the long afternoon's fighting. From time to time small groups of protesters tried to sneak across the barricades, and almost calmly, the police would fire a stun grenade or flare. 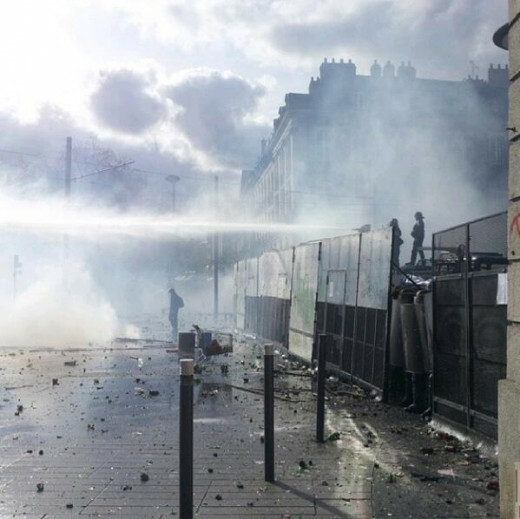 If they kept coming there would be the pressurized hose, then the tear gas. No one ever made it past the tear gas. An hour later, my toes stinging from the cold, I pushed my bike through the wreckage of the city center. Fire trucks were hosing down smoldering piles of barricades and what used to be a tram stop. Graffiti was scrawled on every available surface and an office had been ransacked, papers, desk chair and smashed computer towers strewn across the street. I couldn't help thinking that, for what had started as a peaceful protest against capitalism and for the environment, there certainly was a lot of trash and destruction. The history behind the ongoing opposition of the construction of a new airport, "L'Aeroport du Grand Ouest," in France's north-western countryside. 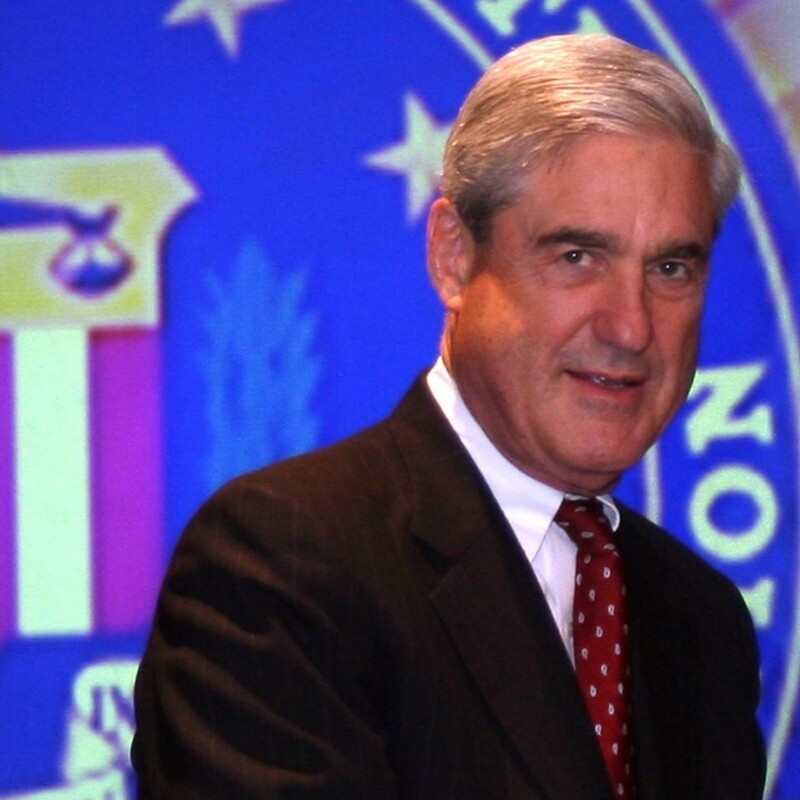 What Is The 'Mueller Report'? Woah... what?! While I can't speak for all French affairs, this is one fight that has absolutely nothing to do with the US. The government wants to create a western industrial and commercial gateway into Europe and the the people are opposed for both environmental and economic reasons... not international politics. Je vous en prie. 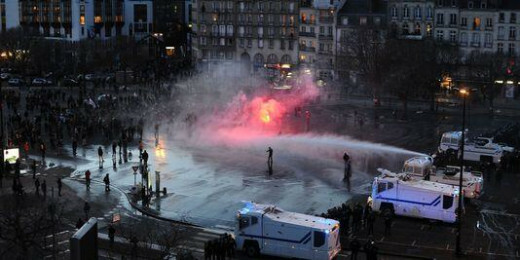 I guess France has enough of those muppets controlling the government. France is a faithful US dog. Which country in Europe isn't?